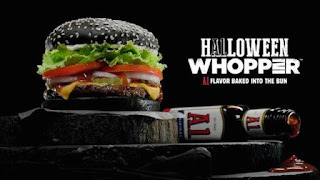 The Horror Movie BBQ: THE HALLOWEEN WHOPPER! Look, I knew this was going to be more hype than anything. I knew this. Heck, I'd have nothing to compare it too, I never order Whoppers anyway. I hate onions and pickles, so those had to go. Mayonnaise on a burger? That I don't mind, as weird as it could sound. A1 sauce? Hmmm...ok. Now I'm intrigued. A1 BAKED INTO THE BURGER BUN ITSELF?!?! Sold. The real pull of this beauty is it's black bun. Which, come on. You're not gonna tell me it's not intriguing. It's also a cool way to cash in on Halloween. As gross and powerful as McDonalds is, I don't see them trying this stuff. Then again, if they did, they'd be ridiculed. 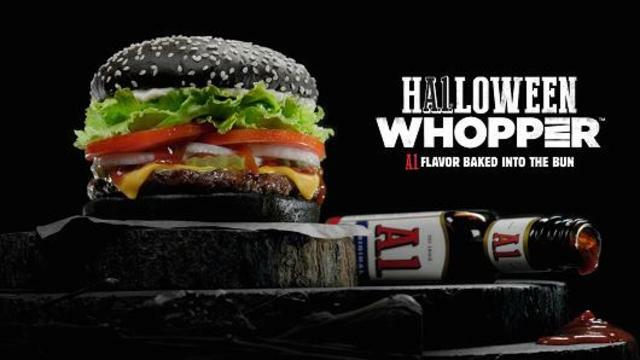 But everyone likes Burger King, so it's ok.
Ok, so I tried this special edition Halloween burger. I gotta say, the A1 sauce was hardly tasted in the bun. In fact, the bun tasted rather stale and no different than a regular burger bun. I didn't taste much difference but I did think it was cool to eat a black burger bun. I guess that's really all I can say about it. I never expected it to taste any different. I just expected it to be dyed and that's it. But, maybe my burger bun was just not cooked all the way. Also of note, the rumors about your poop turning green? True. In fact, I'm guessing there's some people that'll order this for that reason alone. Also, ask for that sweet Halloween Crown. It's pretty darn sweet! So, instead of pictures for this entry, here's a photo montage of my battle with this wicked beast of a burger, as edited by my girlfriend who took a lot of pride and joy watching me eat a disgusting black cheeseburger burger. The green poop is just the cherry on top. BK has won Halloween 2015.